With over 300 million houses in India, over 300 days of sunshine, an ambitious target of 40 GW of rooftop solar by 2020 and various states formulating rooftop solar policies, there should have been a solar revolution in Indian homes. Yet, the situation on the ground is quite different. In the building sector, solar panels are primarily finding their way on the roofs of commercial, government and institutional buildings. Unfortunately, there has not been any major breakthrough in the residential sector. There are only a handful that has opted for rooftop solar energy in the cities despite high environmental awareness and access to technology and support. In December 2015, the Indian government rolled out INR 50 billion (USD 750 million) funding for 30% capital subsidy for rooftop solar installations to create a total capacity of 4.2 GW by 2020. But that has not made the power of natural light attractive enough for consumers or even for solar developers, who are largely focusing on the commercial buildings and institutions. “Suppose I want to install a solar rooftop of 10 KW in my house, it can easily cost me up to INR 1 million. Why should I be willing to spend so much? How will I get returns on my investment? It can take me 5-7 years,” Srinivas Krishnaswamy, chief executive of Vasudha Foundation, a clean energy think tank, told indiaclimatedialogue.net. Currently, there are two ways through which an individual can install a rooftop solar system. (S)he can choose the capital expenditure model by making an upfront payment. For those unwilling or unable to put up the money, there is the RESCO (Renewable Energy Servicing Company) model in which a terrace owner allows a solar developer to install a plant on the roof. The plant is installed, owned and run by the company or investor and the consumer pays for the cheaper power at around Rs 6-7 per unit compared with some Rs 9-10 per unit for conventional supply. The RESCO model has the potential to bring about a solar rooftop revolution because it can tap into the terraces of owners who don’t have the required capital. RESCO is popular among commercial buildings where business owners prefer to invest in the businesses instead of solar photovoltaic units. Currently solar developers prefer investing in commercial buildings instead of private homes due to a number of reasons. The foremost is lack of space. A 10 KW solar plant that can power three air-conditioners and is sufficient for a three-bedroom apartment needs around 1,000 sq feet of terrace area. Unlike in Europe and America, houses in India don’t have standardised roofs and getting the required shade-free area is a big challenge. Besides, solar companies and financers don’t want to invest in plants less than 10 KW capacity under the RESCO model because it doesn’t generate enough power to make profits. Apart from this, most residents don’t want to block their rooftops. They use the terraces for various purposes such as drying clothes, installing water tanks and split ACs. However, raising structures inflates costs, making it less attractive to the investors. 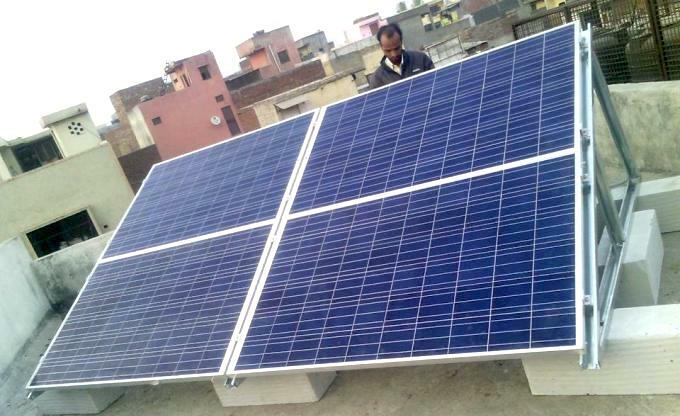 The Delhi government in its policy has tried to promote grouping of various houses, offices and commercial units to tackle both the lack of space and scarcity of net meters (that help consumers to sell excess power to the grid as an incentive), but solar power companies don’t want to get into complexities of dealing with multiple residents or stakeholders for every power plant, unlike commercial units owned by a single company or individual. In residential buildings, the ownership of the roof is also a knotty issue. It is often not clear if the terrace rights belong to the builder, the homeowner or the tenant. Many find dealing with Residents Welfare Associations (RWAs) challenging because, unlike private companies, many RWAs don’t maintain balance sheets and therefore don’t qualify as subsidised consumers. In the midst of all this, solar power developers have to worry about financial security when it comes to residences. “In the residential sector, the large rooftops are the low hanging fruits. While there is a lot of potential, it needs a long-term clarity on how the electricity generated will be sent to the grid and how the home buyers will get the incentives,” Arunabha Ghosh, chief executive of Delhi-based think tank Council on Energy, Environment and Water (CEEW), told indiaclimatedialogue.net. In both the capital expenditure and RESCO models, the excess solar power generated on rooftops is supposed to be fed into the grid and purchased by state utilities. However, doubts are often raised on this because most power distribution companies in India are making losses. Despite the hurdles, there is a silver lining. According to Neeraj Kuldeep, research analyst at CEEW, while the capital expenditure model is dominating in the rooftop segment with almost 85% of total solar installations, the RESCO model in the rooftop solar segment in India, with positive rooftop policy support across many states, is getting traction and showing a year on year growth of 150%. There is a handful of rooftop solar developers catering to the residential sector under the RESCO model. One of them is Jaipur-based Ray Power Infrastructure, which has installed 55-60 KW of solar rooftop power in the residential sector, but this amounts to only six homes in Jaipur. It’s adding two homes in Delhi. Another company, 8Minutes, has installed rooftop solar plants in 10-15 Delhi homes. Mr. Krishnaswamy needs to get an update on the prevailing prices of solar systems in the residential rooftop solar size range – a 10kW system will cost you INR 7 lakhs and the payback time on that investment is 3.5 years! We look forward to taking you Solar!